The way to the "green new deal"
It is in fact a bitter irony – on one hand gardening on a plot is very much in vogue. On the other hand rising real estate prices and the continued influx into the cities mean that allotment sites are increasingly threatened of being overbuilt. The allotment gardeners seem to be helpless compared to the interest in profits of the real estate industry. 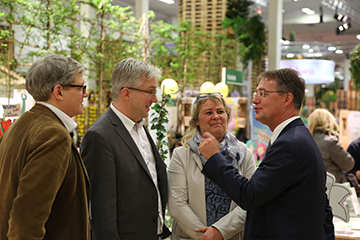 What the allotment gardeners can do in order to react to that threat was explained by the sociologist Dr. Fritz Reusswig from the Potsdam institute for climate impact research during a meeting of various regional federations in Bremen. Just how important the topic is was made clear by Reusswig right from the beginning: Since 2011 the number of allotment gardens has been dropping continuously and only 18% of all the sites are permanently protected by development plans. 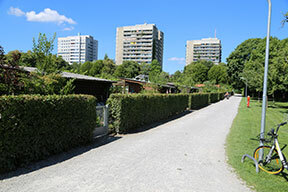 Especially in cities with increasing densification, the sites are threatened by overbuilding – according to the first results of the study, "allotments in transition" by the federal institute for building, urban and space planning (BBSR). In this context it has to be mentioned that allotment gardening is changing: organic gardening is gaining in importance (according to the study 85% of all sites are laid out in a nature friendly way), there are increasingly new garden forms (community gardens) and new groups asking for allotments, such as families with children (85%), couples after the family phase (42%) and families with migration background (72%), said Reusswig. 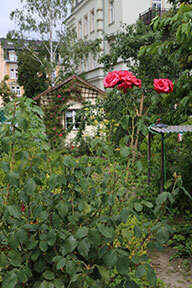 Especially in the metropolitan areas the demand for allotments is increasing. In order to meet this demand and to react to the competition for available areas, the practical approaches used up to now are mainly the re-densification in the stock (the division of gardens), the allocation of unsaved grounds or the creation of other gardening forms on allotment sites and common use. However, these approaches are not transferable to all allotment sites. It is, therefore, important to be actively involved in urban planning. In the medium term, allotment gardeners have to promote the fact that the negative ecological consequences of a building development have to be taken into account in the city budget so that in the end there will be no "black", but a "green zero". Decisive for reaching this aim is that the federations cooperate in scientific studies. The sociologist also recommends to form alliances, especially with "urban gardening", projects that are an adequate offer for this. Reusswig proposes at the end a "green new deal". The allotment gardeners will get a permanent protection of their sites and they will assume social and ecological services. With regard to the eco-system services of the allotment gardens, climate change is an opportunity for the allotment gardeners. Climate change will increase the importance of greenery in the city. This is not only a question of ecological, but also of social justice, since it is precisely the socially weaker people who have the least access to urban greenery and its relief functions. And so the threat could become a path to salvation. Consequently, the allotment gardeners are not helpless – but up to a "green new deal" it is still a long way, which they have to approach in the most active way possible. Amidst a sea of flowers with tulips, daffodils and primroses, on the edge of an imitation of the Berlin metropolis made of wooden pallets, the allotment movement of Berlin, the German Schreberjugend and the federation of German allotment gardeners (BDG) presented themselves in the flower hall during this year's international Green Week 2019 with a concentrated horticultural knowledge. The BDG cooperated with the German Schreberjugend. The visitors received useful information concerning raised beds, natural gardening and the stimulation of insect and plant diversity. And as it should be, knowledge transfer works best with a practical demonstration – hundreds of small insect hotels were built with drill, hammer and logs and they could be directly taken home by the builders. 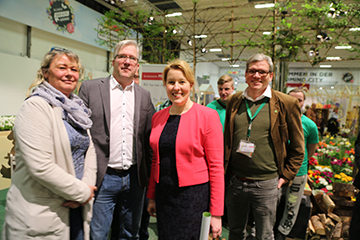 Also high ranking visitors such as the federal minister of family affairs Franziska Giffey, State secretary Gunther Adler (BMI), and Parliamentary State secretary Marco Wanderwitz (BMI) did not miss a tour through the flower hall and thus received a foretaste of the coming spring. They were interested in the allotment gardener's exhibition stand. Finally, the BDG had the opportunity to address important issues such as the property tax reform during these discussions. 24TH FEDERAL COMPETITION "GARDENS AND URBAN PLANNING"
The winners of the 24th federal competition "gardens and urban planning" have been announced: Six gold, ten silver and four bronze medals were awarded in Berlin on 8th December 2018. In addition, a total of 25,500 € prize money was awarded. The awards recognize the allotment garden associations' special achievements in the social, ecological and urban development areas. The motto this year was: "small gardens – colourful variety". 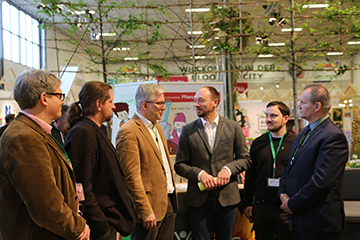 "They give a home to insects, live integration and stand together as a community: Our 20 finalists are outstanding examples of how important the small gardens are for our cities and our communities", explains Jürgen Sheldon, chairman of the jury of the national competition. "We are proud of our allotment gardeners, because they show that even with limited resources much can be achieved". 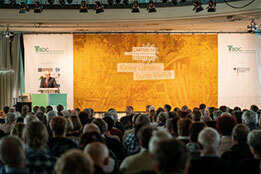 Every four years the federal government and the federation of German allotment gardeners (BDG) give the allotment gardeners the opportunity to participate in the championship. An expert jury examines all the finalists very carefully on site and assesses whether the facilities hold what they promise. 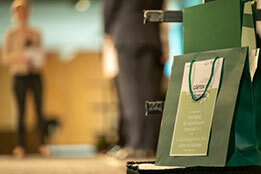 This year the jury was particularly enthusiastic about the allotment gardeners' innovative spirit. "Rent-a-Beet" (rent-a-plot) concepts make it easy to start gardening, the harvest is shared so that fruit and vegetables do not rot, and numerous projects to protect species create refuges for rare animals – sometimes in the middle of the city. Natural gardening is great anyway – herbicides and chemical-synthetic antifungal agents and chemical-synthetic agents against pests have been banned for a long time. Bees are kept in 19 out of the 20 facilities, and luxury style insect hotels are standard. All sites show: The allotment gardeners have started their way into the future since a long time and tackle challenges – whether species protection, intercultural living together or generational cohesion. was awarded to the allotment gardeners in Berlin, Chemnitz, Hildesheim, Karlsruhe, Landau and Rottweil. was awarded to the allotment gardeners from Bremen, Castrop-Rauxel, Dresden, Düsseldorf, Hamburg, Kellinghusen, Löderburg, Munich, Schwerin and Torgau. was awarded to the allotment gardeners from Altenburg, Kassel, Osterburg and Neunkirchen.